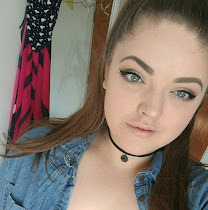 Rimmel is one of my favourite brands of all time; they're always one that I can rely on when I need something that does what it says it's going to do and they're affordable. 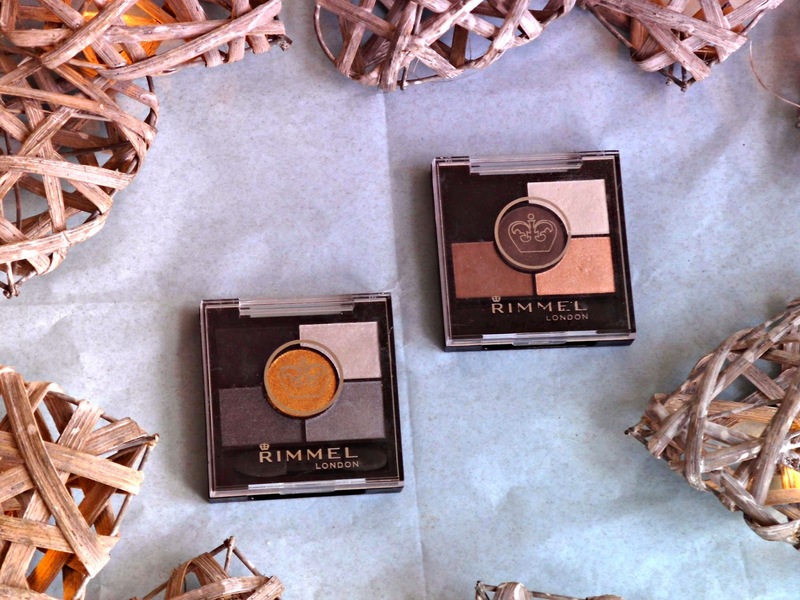 BUT I've never tried any of their eye-shadows before which is crazy considering how much I love them as a brand! I saw one of these Glam'Eyes HD 5 Pan Eyeshadow palettes in Asda while I was wandering through the toiletries aisle and decided to give it a go! I liked it enough to pick up another one a few days later! The first one I picked up was in the shade Foggy Grey which is a very neutral based palette. 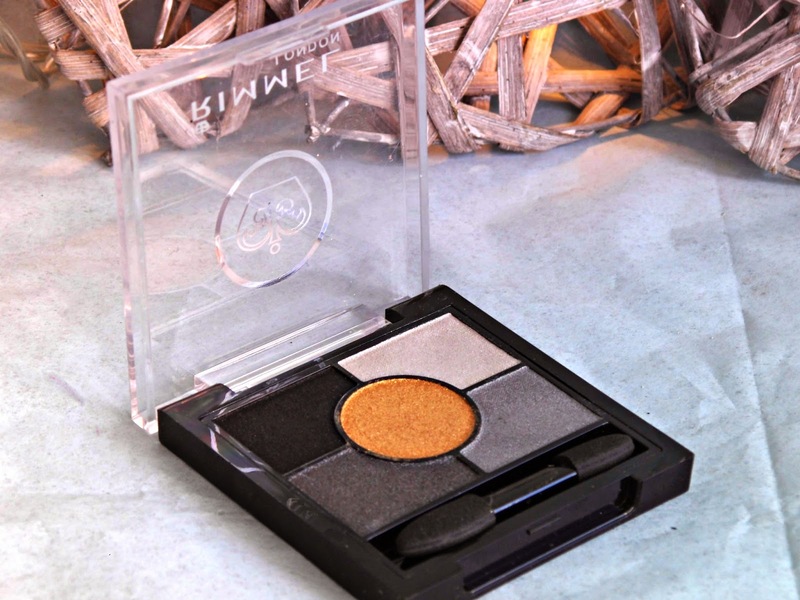 It contains a a shimmery white shade, a shimmery peachy champagne shade, a matte warm toned brown shade, a matte taupe brown shade and a matte black shade. 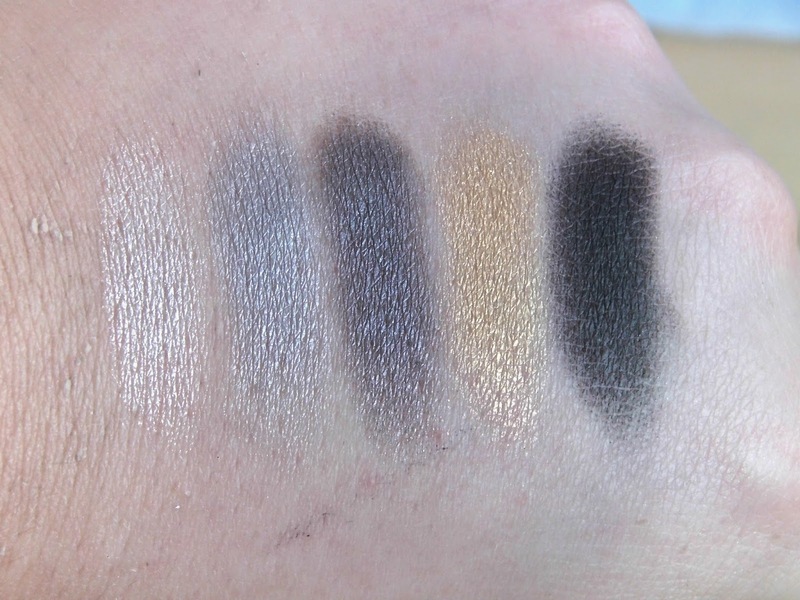 The shades themselves when swatched remind me of those in the naked basics palette (minus Foxy) only with different finishes and less pigmentation. I don't own the basics palette but I've swatched it and this immediately reminded me of it... you get the idea. The pigmentation of these shadows isn't spectacular but you can definitely work them up to a stronger finish, but for everyday I think it's just enough although I would like some more pigmentation. I've been using the taupe brown shade (the one in the middle of the palette) to fill in my eyebrows with on days when I haven't wanted to dig around in my make up bag for other things. The peachy shade is a great highlighter for the brow-bone, inner corner and on the cheekbones if you're feeling lazy! I was possibly most impressed with the black though, as it's really pigmented and a true black! 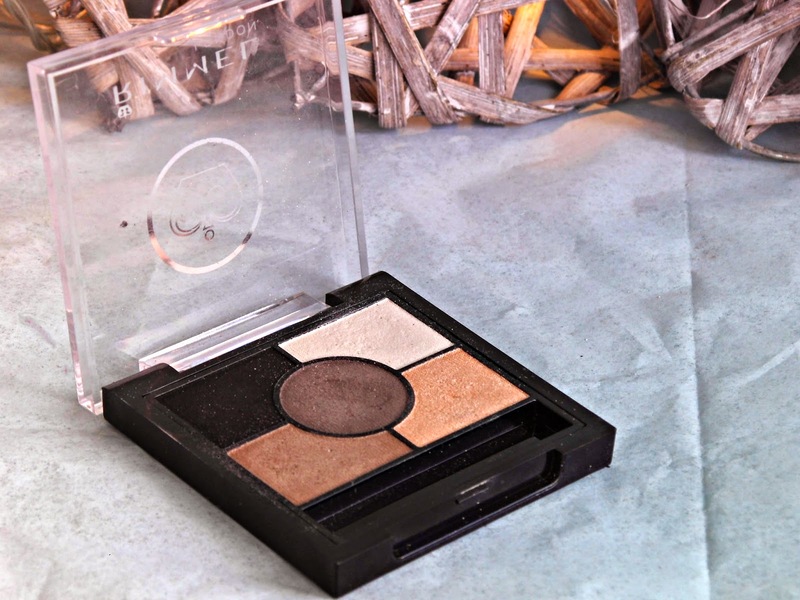 This is a whole neutral eye look in one little palette which is really handy. The second one I picked up is this one, in the shade Golden Eye which is a metallic palette. 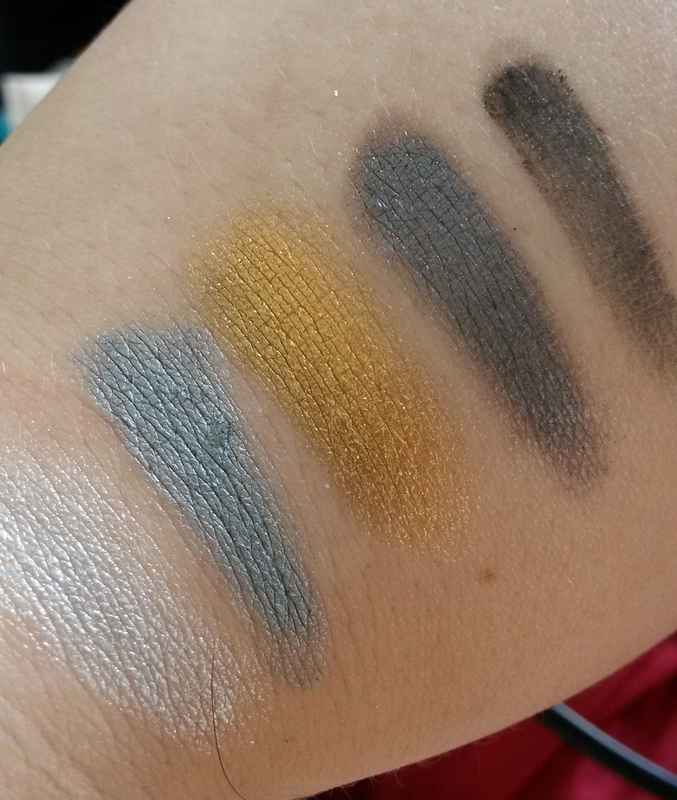 There is a silver shade, a steel grey shade, a gunmetal shade, a gold shade and a matte black. This palette on the whole is a lot more pigmented than the first, and the colour is a lot more intense. Unlike with the first one, I probably wouldn't use all 5 of these shades together on one look but I think it's great that they're all in one 'metallic' palette. I really love the gunmetal shade and I think it would look beautiful in a smokey eye to bring a little more to the look! The light silver would look amazing in the inner corner to give an almost wet look and really open up the eyes! Again, the black is super pigmented and I just like that there is a black in both because it's always handy to have a black shadow. I did a little research into these eye-shadows for this post and I noticed that on the Boots website it states that they can be used wet or dry. I really love eyeshadows that can be used wet or dry because I feel like you can get so much more out of them in terms of texture and so I thought that this was a great touch! Unfortunately, when I tried using them wet I didn't really see any amazing difference in pigmentation or texture at all which was a little disappointing. 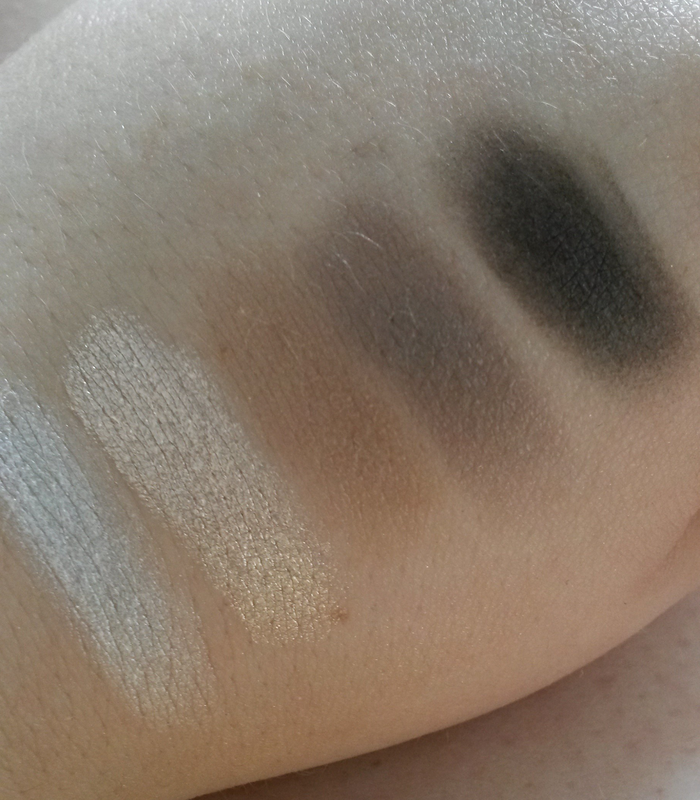 The colours are a little bolder but nothing too extreme and you can see in the swatches below, the black seemed to have lost the strong pigmentation that I was so impressed with to begin with so I think I'll just stick to using these dry! I quite like the packaging. It's compact and actually quite sturdy considering it's made out of plastic, although the pan containing the shadows themselves has popped out of one of them but that's easy enough to pop back in. What I also really love about them is that they have a diagram on the back which numbers the shadows and shows you where to use them on the lid to create a full look with the palette, which is really helpful especially if you're not confident with which shadows to place in where etc. You can find these in Boots and Superdrug and in most supermarkets in the little cosmetics section - I got mine in Asda and they retail at around £6 or £7 which I don't think is too bad considering you're getting a complete eye look with 5 shadows in one palette and you can use them in two different ways! There are a few other colours in the range which look really lovely and I think I might just have to pick those up sneakily too! I can't believe I waited so long to try these.